Lucky Lightning is a 3-reel, one-payline video slot machine which offers huge payout to its players. The theme of Lucky Lightning is naturally lightnings, with electrical bolts scrolling down both sides of the machine. The idea may be that lightning can strike the same place twice which is what a player is hoping for. The symbols on the reels are Red Sevens, Bars, Oranges, Cherries, and Plums. Just like a traditional slot machine, there are no wild symbols or scatter symbols. Play Now and prove the myth of Lightnings not Striking twice in the same place wrong, cause they'll surely hit the paylines more than twice for you. Play Lucky Lightnin' Now! The history of the Lucky Lightnin' three reel online slots dates back to the land of San Francisco when Charles Fey invented the first mechanical slot machine in 1899. This slot machine was christened as the Liberty Bell and had three reels with five symbols including, diamonds, hearts, spades, horseshoes and liberty bell. This machine worked out on an automatic payout mechanism i.e. : you can win a jackpot of 10 nickels if you spin three bells in a row. As the time passed away, the popularity of this slot machine gave a way to the various other modified versions of free slots. 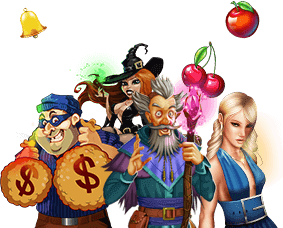 The objective of Lucky Lightnin' online slot is to line up the three matching symbols on one payline. The red line at the center of the reels is branded as the payline in the game. The payouts differ from one winning combination to another and the number of coins that you bet with. To illustrate, if you bet with one coin and get three oranges on the payline, you'll win100 coins. But if you bet with two coins and three oranges line up on the payline, you'll win 200 coins. Similarly, you win 300 coins if you bet with three coins and reel in three matching oranges on the payline. For this online slot there is no special strategy but you have to play with concentration! Once you have located the even paying Lucky Lightnin' online Slot, you must wager with maximum betting value that is three coins. If the Slot machine pays you between 1 to 3 times of your bet, then play on this machine only once more and then leave the machine. However, if it pays out 4 times of your wager, you can go ahead and play for another three times. Payline: Payline is a red line in the center of the reels in the Lucky Lightnin' online slot where designated combinations align to give you rewarding payouts. Bet: In Lucky Lightnin' online slot the reels refer to the three rotating rows on the machine with six different symbols on it. Coins Played: The coins played refer to the number of coins or credits that you use to play the game. For instance, if you choose to bet with three credits or coins with a coin size of $1, you are basically betting with $3 on the single game.